Wholesale stationers, Worthing. In his delightful book, Collecting picture postcards (1996, Phillimore, Chichester), Geoffrey Godden recounts the history of Ramsden's or Ramsden Bros., who supplied picture postcards to a widely scattered array of shops in southern Sussex. 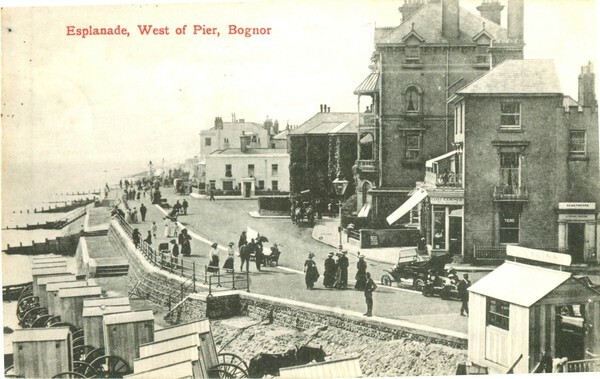 From 1909 to 1921 the firm was based at 7 The Broadway in Brighton Road, close to the Gardiner Studio. By 1919 it had opened a branch shop at 31 Station Road, Worthing, and taken over from C.E. Thomas at 11 Chapel Road, renaming the business "Ramsden's Library". B. S. Dand, former buyer and manager to Harrods, was employed as librarian, in charge of "many thousands of novels" and reference works. Ramsden Bros. closed in 1957. Ramsden Bros. sold real photographic cards labelled "Published by R. B., W." or "R. B -W." on the back or in some instances on the front. Some were the work of the Paris publisher Levy et Cie. (views of Chichester, Bognor and Newhaven) or Alfred Wardell, the Brighton publisher (air views of Worthing). Other cards with sepia-tinted photographs, orange-red printing on the backs and "R. B W." on the front were almost certainly supplied by the Tunbridge Wells photographer, Harold Camburn, though they are not labelled as such and lack his logo. A coloured multi-view of Newhaven in the Exceller Series reproduced a selection of Arrow Series cards, but was labelled "R. B., W." on the back. Ramsden Bros. also issued glossy-surfaced black and white halftones of Worthing, Arundel and other places that are less recognisably the work of other publishers and which they may have produced themselves. In a poor light the cards are easily mistaken for real photographics. The pictures lack borders and have neatly printed black or white captions. The cards normally have brown printing on the backs, but the Arundel examples, which were on sale during the First World War, have backs with green printing. Also on sale during the war were a series of cards of Beeding with serial numbers prefixed by the letter "T" (e.g. No. T 14). These had been printed in Germany, presumably before the outbreak of hostilities. In addition to the halftones, Ramsden Bros. issued numerous collotype cards (black and white, with black or red captions) of Worthing, Lancing, Littlehampton, Slindon and Arundel. As with the halftones, more research is needed to determine the extent to which the cards were really new and not merely reprints of other publishers' work. They were on sale by 1919. The founder of Ramsden's was Henry Ramsden, who was born at Wortley on the south-west edge of Leeds in about 1847. His wife, Mary, whom he married in about 1868, came from County Cork in Eire. In 1881 Ramsden was working as an ironmonger's shopman in Wortley; by 1891 he had become an assistant ironmonger at Darwen in Lancashire. Mary bore him two daughters and then two sons: Clara W. Ramsden in about 1869, Amy Ramsden in 1870, James Herbert Ramsden in 1872, and William Conyers Ramsden in 1876, all born in Wortley. After many years in the North, Henry moved with his family to Worthing, though why is not known. Perhaps he wanted to get away from all the industrial pollution and enjoy fresh sea air! When the 1911 census was held, he and Mary were living at 7 The Broadway over the stationer's shop with Amy, James and William, who were unmarried. Both James and William were helping their father as assistant stationers, and soon after replaced him, renaming the business Ramsden Bros. Henry Ramsden is believed to have died at Worthing at the age of 82, in 1924. According to Godden, James and William secretly sold out in the 1930s to a local printing firm, which retained the Ramsden name and continued to operate the business without publicising the change in ownership. William died at Worthing in 1947, followed by his older brother in 1950.